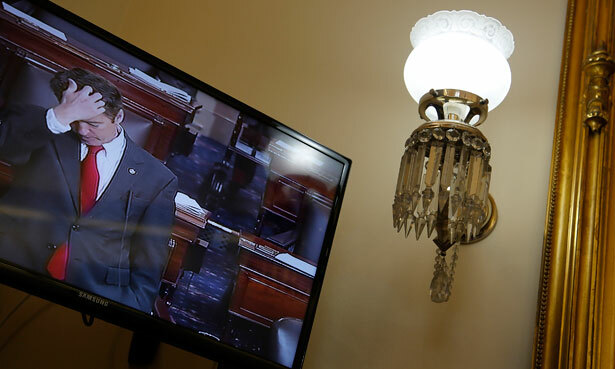 Rand Paul provided an illustration of what filibuster reformers have been seeking. When the Senate organizes itself every two years, the members set the rules for the coming term. This year, a number of senators—along with citizens and commentators from across the country—argued unsuccessfully for filibuster reform. Frustrated by delays in consideration of policies and nominations, supporters of the reform argued that the rules had to change in order to get a dysfunctional Senate functioning. But it is important to note that reformers did not seek an end to the filibuster. Rather, the goal was the restoration of the filibuster as it was historically known—as a “talking filibuster” that requires a dissenting senator to speak his objections, hour after hour, into the congressional record. The freshman Republican’s filibuster of the Brennan nomination lasted from 11:47 Wednesday morning until 12:39 Thursday morning, clocking in at just under thirteen hours. Yet, this was a genuine filibuster, not merely in style but in content. Of course, as is often the case with talking filibusters, there was a measure of grandstanding and over-the-top speechifying — not to mention assertions that have already drawn disagreement from not just Democrats but Republicans such as Arizona Senator John McCain. And there can be no question that some of the Republicans who were cheering Paul on undoubtedly cared more about griping generally with regard to the Obama administration than restoring a pristine separation of powers. Paul's no progressive hero. He's wrong on plenty of issues, he's often combative and he seems to be positioning for a presidential run that could well see him steer away from the libertarianism he once espoused and toward conservative orthodoxy. But it is not necessary to agree with Paul to respect the fact that he was raising serious issues, and doing so with an eye toward getting both his fellow senators and Americans who watched the speech on C-Span engaged with those issues. It was for this reason that Oregon Senator Ron Wyden, a Democrat who has been focusing with increasing frequency on constitutional issues, was among those who helped Paul by coming to the floor to ask questions—often in the form of extended expressions of concern about executive overreach in general and targeted killings in particular. Wyden has, with Paul, formed a Checks and Balances Caucus, along with Senators Mike Lee, R-Utah, and Mark Udall, D-Colorado. The senators come not just from separate parties but from separate ends of the ideological spectrum. They are united in raising questions and concerns about the extension of executive power, especially when it comes to espionage and domestic manifestations of the war on terror. This is not the first time right and left have come together on civil liberties issues. Rand Paul’s father, former Congressman Ron Paul, R-Texas, was one of several House Republicans who voted with Democrats such as Wisconsin Senator Russ Feingold against the Patriot Act and who joined Democrats in objecting to domestic surveillance initiatives that critics recognized as threats to civil liberties. Even now, at a rancorous moment in American history, Paul and Wyden suggest that there are places where senators can come together in defense of civil liberties. “The issue of American security and American freedom really doesn’t get enough discussion here in the United States Senate and it’s my view that the senator from Kentucky has made a number of important points this day,” Wyden said Wednesday. Those points went beyond the wrangling over the Brennan nomination, which will go forward with the support of Wyden and, presumably, most senators. This is where we see the difference between the abuses of the filibuster by senators who quietly submit vague objections and the talking filibuster. Threatening to filibuster a bill or an appointment for the purpose of obstructing the majority is just that: obstruction. Talking filibusters may frustrate senators and citizens. And they are not always noble in intent or practice. But they serve a purpose. That’s why filibuster reformers argued not for the elimination of the filibuster but for the restoration of the talking filibuster as it was employed by Jefferson Smith. Peter Van Buren argues that the Iraq invasion was the single worst foreign policy decision in American history.